In the Mail Settings area you can enable, disable or edit the messages that are sent automatically for different actions. This is very useeful, since mail notofications will keep a user always up-to-date regarding his account actions. Bidder - new message: Sent to bidder when he receives a new reply from the auctioneer. Auctioneer - new bid: Sent to auctioneer when a new bid is made on his auction. Bidder - bid lost: Sent to losing bidder. Bid canceled: Sent when the bid is canceled. Bidder - auction canceled: Sent to bidders on an auction that got canceled after. Watchlist - auction closed: Sent to users when a watched auction is closed. 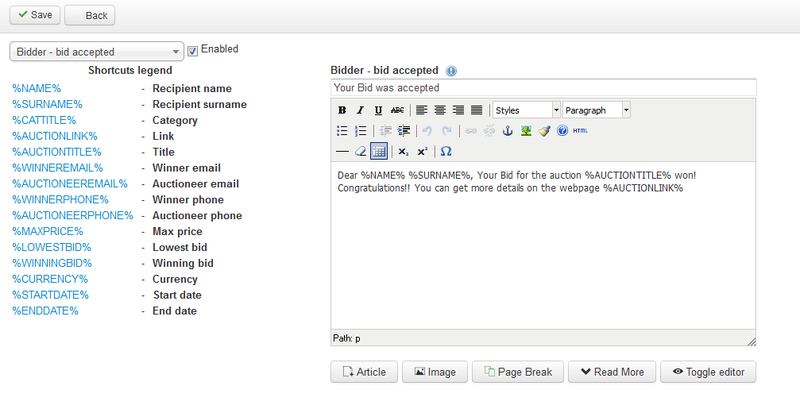 Bidder - auction closed: Sent to bidders on an auction that got closed after. Auctioneer - new admin message: Sent to auctioneers when they receive messages from the administrator. Auctioneer - auction about to expire: Sent to the auctioneer the day before the auction will expire. Watchlist - auction will expire: Sent to users when a watched auction will expire in 24 hours. Watchlist - auction added to watched category: Sent to users when a new auction is added in a watched category. Auctioneer - auction created successfully: Sent to the auctioneer when the auction is created. Auctioneer - closed by admin: Sent to the auctioneer when an admin closes his auction. Admin - auction pending approval: Sent to the admin when a new auction is posted and awaiting approval. Auctioneer - choose winner : Sent to the auctioneer when an auction closes and manual winner selection is chosen. Bidders - send invitation to bidders for auction: Send invitation to bidders for new "invite" type auction. Users - new request withdraw funds: Sent to users that had requested funds withdrawal. Admin - new pending request for withdrawing funds: Notify admin related to a new request for withdrawing funds. You can enable or disable just some of the messages by clicking on them from the drop-down menu and checking or unchecking the checkbox. If you want them all to be activated make sure to verify them one by one! (!) The CRON task has to be configured and running regularly in order for all of the notifications to be sent. The Tools page allows you to manage the database of your website regarding the available auctions or the component itself. You can export and import auctions by using .CSV, .XLS files or backup the database of the component entirely and restore it whenever it is needed. With Import auctions from CSV, you can import data as a bulk upload, which will append the data to your existing database. This will help, for example, with populating your database much more easily, unifying the existing records, which are kept in different formats. To import a CSV file, click on the Choose file button, select the file from your HDD and click on the Upload button found at the top of the page. Having a .zip file containing images of these auctions can also be uploaded the same way with the provided field. For more information regarding the structure of the .CSV file please check our Reverse Auction Factory - Import Auctions from CSV Guide. Full Backup tool allows you to create a .zip file which includes all the SQL files of Reverse Auction Factory and the images added on created auctions. First view the Backup path. This needs to be Writable in order to create the backup file. You can also see on which folder from your server the file will be placed into. Check Download if you also want to have the archive on your PC, the download will start once your press the Backup now button. By checking this you can also erase the file from server by enabling Remove backup after download. 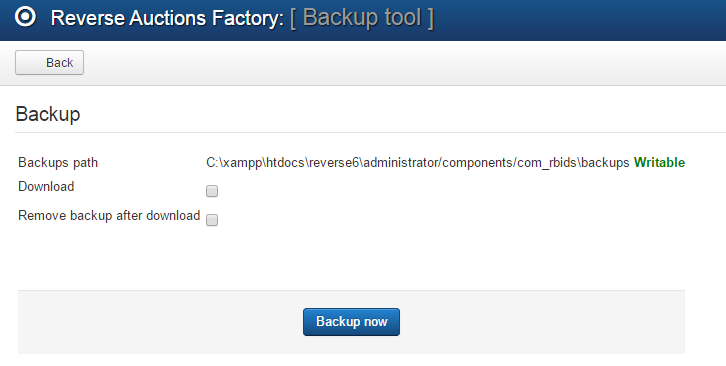 To restore a backup file previously created, simply click on the Choose file button and select it from your PC. Before clicking on Save to start the restore process, check the Local file field which needs to be Joomla's path from your server. Overwrite existing images will delete all your current images of Reverse Auction Factory and leave only the ones found on the archive. (!) Export auctions to XLS will save an Excel spreadsheet with all the auctions on your website in your desired location.